Yesterday RIM released simulators for a number of new BlackBerry devices such as the Torch 9810, Curve 9360, and the 9850. 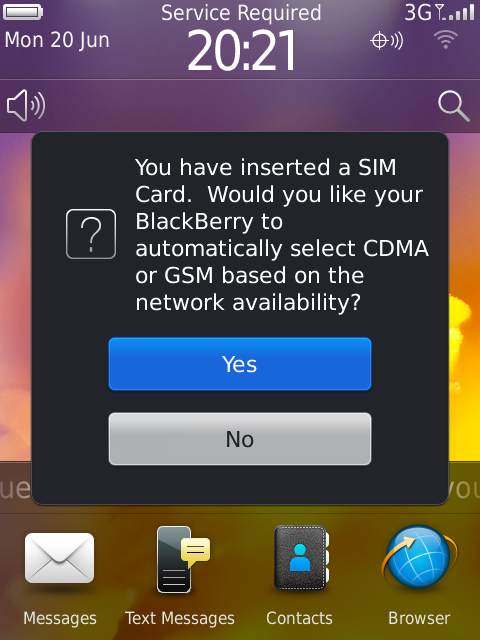 When first launching the 9810 simulator you get the screen seen to the right that asks about selecting CDMA or GSM compatibility. This is an option that is traditionally only seen on CDMA devices designed for Verizon or Sprint’s networks. In fact none of the current BlackBerry’s have any CDMA support unless they were specifically aimed at one of these two networks. This would seem to imply that the Torch 2 will be available on more networks in the United States, and not be limited to AT&T. Now, none of the other leaks in regards to this device imply that it will be available through Sprint or Verizon, so there is a chance that this is just a fluke in the simulator and will not come to anything. On the other hand, now that RIM is using Qualcomm chips in all of their high end phones there is no technical reason why this single phone couldn’t support all of these networks. So here is to hoping that RIM’s best form factor is available to everyone.